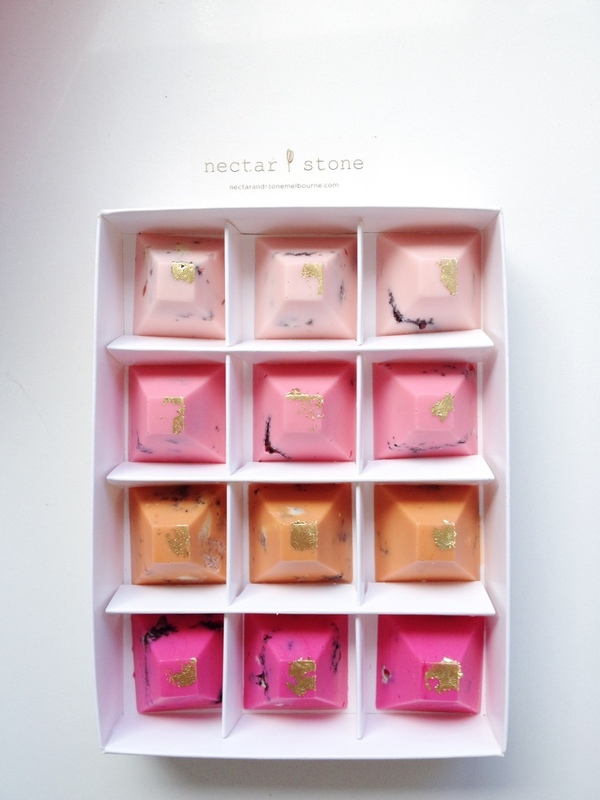 As I probably won’t ever be able to buy anything from Nectar and Stone myself, I thought I would try my hand at making some chocolates inspired by their designs. It was actually really easy, all I did was melt down white chocolate and colour it with different shades of pink. I poured different layers of the coloured chocolate into a silicone pyramid mould and sprinkled in some crushed oreos for the monochrome effect. When I popped these pretties out of the mould, I was really surprised and pleased with how they turned out. All I did to finish them off was apply a small smattering of gold leaf to the top of each pyramid. Don’t get me wrong, I know they are no Nectar and Stone chocolates (see the first two photos for my attempt and the last photo for a comparison to the real thing) but they do look lovely and weren’t hard to make at all. They are the most original and stylish chocolates that I have ever seen, and next time I make them I will be packing them up in nice boxes and giving them as gifts to my friends. These look amazing! I've been browsing the internet as I want to make some myself - great tip with with Oreos for the marble effect, I'll definitely be doing that!